Those who have small kitchens tend to have more difficult time having a kitchen makeover. On top of other things, you have to consider the space and find ways to maximize it. And, that you are on a budget makes this home improvement project even more challenging. 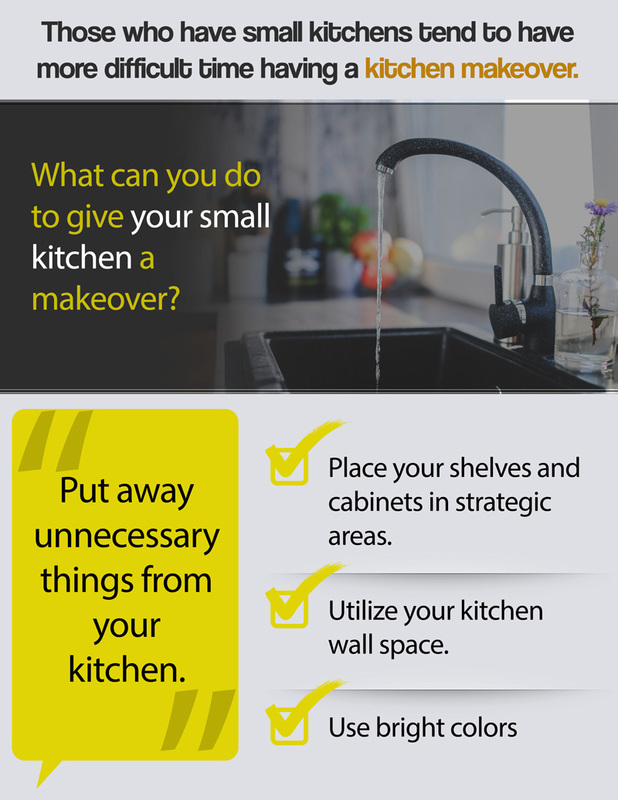 So, what are the things you can do to give your small kitchen a makeover? Put away unnecessary things from your kitchen. The things that should only be found in your kitchen are the ones necessary for food preparation and other kitchen tasks. Put away the unwanted trash and clutter, which not only takes up space but also makes your kitchen look untidy. Also, put away small appliances that you do not really use, such as your waffle or sandwich maker. Place your shelves and cabinets in strategic areas. Since you have a small kitchen, carefully managing your storage space cannot be overemphasized. Whether you opt for cabinets or shelves where you can store your utensils and other kitchen items, make sure that they are in proportion to your small kitchen. Otherwise, things will not be properly organized, making an impression of cluttering and disorganization. Moreover, you are advised to consider the below spaces before going out for the upper shelves and other storage spaces. Having simpler looking shelves is also advisable, as it allows you to locate your cooking items more easily. Utilize your kitchen wall space. Since your kitchen is small, it is even more important that you make the most of the kitchen space that you have, and that includes the wall. Have wall hooks, from which you can hang kitchen items, saving you more space. White walls give the kitchen a larger feel, but make sure to add pops of colors to help create a happy space. You can incorporate bright colors in your cabinets, appliances, or lighting. for you and your household members. Those who have small kitchens tend to have more difficult time having a kitchen makeover. What can you do to give your small kitchen a makeover?